Many have speculated who actually painted the famous RLDS painting of Joseph Smith Jr.. Joseph reported sitting for a painting by a Brother David Rogers on September 16, 1842. Some experts drew a line to the famous painting, claiming that the well-known RLDS painting was it. The problem with their theory? We have the painting done by Rogers and Joseph is sitting in his standard profile stance. Well, if it wasn't the work of the artist Rogers, who did it? There has been a fairly large consensus that it was the work of a Nauvoo portrait artist named William Major. The problem with this theory is that in comparing the work of Major and the RLDS painting we see that the artist styles do not match. Whoever painted the RLDS painting knew a great deal more about layering skin in oil and creating depth. Artists tend to always have an individual style, kind of a fingerprint of their work. Especially when problem solving difficult issues in their artwork. 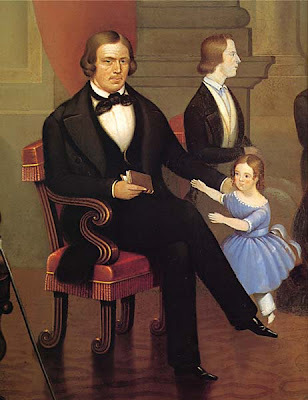 Here is a portrait of Brigham Young done by Major around 1845. While cruising the internet I stumbled onto an article about another artist that was present in Nauvoo in 1845, and as a matter of fact, he shared an artist studio with William Major. His name was Selah (Seal) Van Sickle and was a self-taught artist. I went back to scouring that internet for his work, the only image I found was a black and white, low resolution photo of Brigham Young, titled "Delivering the Law of the Lord". The original painting is located at the Daughters of the Utah Pioneers building. They have graciously allowed me to post part of their copyrighted painting on my blog. If you are interested in seeing the full work or getting a copy of Van Sickle's painting please contact them at http://www.dupinternational.org/. 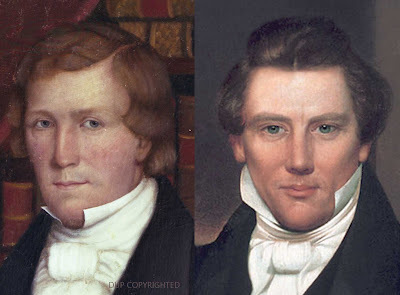 Below is a side by side comparison of the Brigham Young painting and the RLDS painting of Joseph Smith. The two faces have a very similar artistic style. Being an artist myself I could probably sit and list a good hundred similarities, but that's a bit boring and most readers can easily see what I am talking about without that aid. I will say, that when examining the entire painting, I am led to the conclusion that Van Sickle was quite talented when it came to painting faces, but an amateur in regards to understanding perspective. Though it's not uncommon for an artist to be highly skilled in one area and undeveloped in another. Van Sickle tended to elongate the necks of his subjects in an effort to create a regal-like effect but in reality it really only creates an unnatural appearance. What does all of this have to do in regards to my Joseph Smith Jr. photo? Well, if Van Sickle or Major painted the famous RLDS painting, it was done after his death, because neither were in Nauvoo before the Prophet's death. Where did the artist get the source of information for such a detailed painting? Hmmm, perhaps the source was a daguerreotype and the artist used a Camera Lucida or Obscura to enlarge it. Remember, all the other known artist works of Joseph done during his lifetime were done as profiles. As another artist, I concur with your conclusions and research that the artist, Van Sickel, who painted the Brigham Young painting had a style compatible to the Joseph Smith painting owned by the RLDS Church. Thanks for investing time into this and unearthing more facts to consider. I noticed a portrait sold at Cowans Auction. They presumed it to be that of two Mormon children. While the identities of the children in the portrait are questionable (I don;t believe their theory), I believe the artist to be David W. Rogers. Why do I have this assumption? The portrait was in the possession of Guglielmo Giosue Rossetti Sangiovanni (Sanjo), the son of Susanna Mehitable Rogers. She is the daughter of David W. Rogers. I believe the portrait to be a family keepsake from his grandfather. The auction sold the portrait with other personal items such as Sanjo's Italian Missionary Bible. 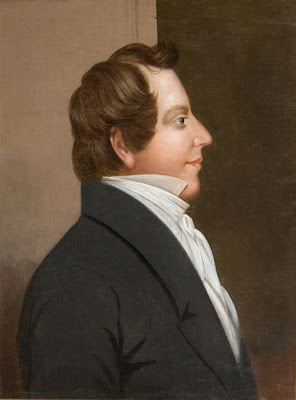 If the portrait was done by David W. Rogers, it shows greater talent than the profile Portraits of Joseph Smith associated to him. ca 1847, oil on canvas, unsigned. A portrait of two children—the boy is seated on a bench beside a trellis covered with grapevines, peeling a piece of fruit, and the girl is kneeling beside him, holding a small bunch of grapes, her left hand outstretched to accept a piece of the peeled fruit. In the background is a river landscape with a wagon train, an allegorical element commonly found in contemporary and historic Mormon art. In its original, gilt frame; 38” x 31” (w/o frame), 44.5” x 37.5” (w/frame). An old paper label tacked to the back of the frame reads GGR Sangiovanni Deadwood So Dak, and the lot is accompanied by an 1821 Italian bible that is inscribed Susanna M. Sangiovanni A Present From Mrs. Rossetti March 1890 along with two manuscript letters: one providing the history of the bible’s ownership; another, a brief statement concerning GGR Sangiovanni’s birth and ancestry. The letter specific to the bible bears an additional ink signature by Sangiovanni, notarized by a Deadwood notary in 1908. That signature and the label attached to the painting appear to be by the same hand and from about the same period.